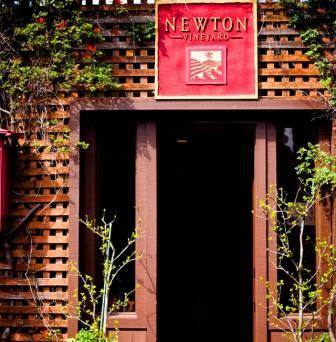 Newton was founded in 1978, with the purchase of 750 acres of land by Peter Newton and Su Hua. Prior to purchasing Newton, Peter Newton was already an experienced vineyard owner, as he founded Sterling Vineyards in 1964, where he became acquainted with Ric Forman. After selling Sterling to the Coca Cola company in 1977, he was ready to return to the wine business, which is how he went on to create Newton. The initial purchase of land had vines located in Saint Helena, above Madrona Avenue. Peter Newton purchased the land from the Meyer family. At the time of the purchase, the entire vineyard needed to be completely replanted. At best, a few remaining grape stakes were found that were probably remnants from the last time the vineyard was cultivated, prior to Prohibition. By 1978, everything was forest land. The purchase price at the time for the hillside property was about $750,000, making it an average of $1,000 per acre. Ric Forman was made an initial partner in the winery, which produced their first wine, from the difficult 1980 vintage. Ric Forman was also the winemaker for the first few years. The majority of the land was not fit for cultivation. Originally only 50 acres were planted, with 20 additional acres of plantings along the way. David Abreu and Ric Forman planted the vineyard and created the drainage and irrigation system. The logo found its inspiration from a single pine tree that now towers more than 100 feet! The tree is planted on the top of their peak elevation. The actual winery was designed to be a part of the natural surroundings, combining a mix of both cultures, those of Peter Newton, with an old, English phone booth with British landscaped gardens and also honoring the Asian culture of Su Hua, with the pagoda and and screaming red, Chinese gate. In 2001, Newton sold the majority if their interests to LVMH who own several different vineyards, most notably Chateau Cheval Blanc in St. Emilion and Chateau d’Yquem in Sauternes. Peter Newton passed away in 2008 at the age of 81. Today, Newton owns close to 560 acres of vines in Napa Valley, much of it on terraced, hillside plantings. The soils are as varied as the terroir, as you find a lot of clay, rocks, stones, sandstone and shale, with various elevations, slopes and exposures. Newton has vines in multiple locations in Napa Valley with their best parcels located in three appellations. They have 50 acres on the steep slopes of Mt. Veeder. In Yountville they own 118 acres of vines and they also have vineyards on Spring Mountain. Newton produces a plethora of different red wines from Bordeaux grape varieties and Chardonnay, some of which are vineyard designated wines. Newton produces 3, single vineyard Cabernet Sauvignon wines, from Mt. Veeder, Spring Mountain and Yountville. Newton makes single vineyard Chardonnay from vines in Knights Valley and Carneros. Several years ago, Newton also produced Sauvignon Blanc, but those vines were removed and replaced with Chardonnay. Additionally, Newton makes Puzzle, which is a Right Bank Bordeaux blend, dominated by Merlot. Lastly, Newton also releases 3 unfiltered wines, from Cabernet Sauvignon, Chardonnay and Pinot Noir. They produce an entry level Chardonnay, called Newton Red Label Chardonnay. Newton Cabernet Sauvignon is best served at 15.5 degrees Celsius, 60 degrees Fahrenheit. The cool, almost cellar temperature gives the wine more freshness and lift. Young vintages can be decanted for 1-3 hours, depending on the character of the vintage. This allows the wine to soften and open its perfume. Older vintages might need very little decanting, just enough to remove the sediment. Newton is best served with all types of classic meat dishes, veal, pork, beef, lamb, duck, game, roast chicken, ribs, hamburgers, barbecue, roasted, braised, grilled dishes and stews. Newton is also good with Asian dishes, hearty fish courses like tuna, salmon, mushrooms and pasta. Newton Chardonnay is best served with all types of seafood and shellfish, sushi, sashimi, chicken, veal, pork and cheese. Easy drinking charmer, with loads of sweet, fresh, ripe, juicy tropical fruit, pears and apple notes. The wine offers freshness, volume and fruit and it's showing great today. Hints of tropical fruit, honeysuckle, pear and white peach, citrus rind and vanilla aromatics bring you to a rich luscious, ripe, sweet, styled wine that is forward, round and finishes with a blast of fruit and oak as well. In a great place, if you like ripe, juicy, citrus, pears and green apple with vanilla and tropical accents, lush textures and a buttery, sweet, fresh, fruit filled finish. Flowers, white peach, apple, citrus and a hint of fresh pear sensations open to a soft, inviting, fresh, clean wine that is ready to drink now. Blending 83% Cabernet Sauvignon, 8% Syrah, 7% Petit Verdot and 2% Malbec, the wine opens with espresso bean, vanilla, blackberries, cassis and earthy notes. This should be better in a few years. You can expect a lot of work to begin taking place in the vineyard and cellars over the next few years at Newton. Fresh herbs, blackberry, oak and olive tapenade scents lead to an easy to like, open style that ends with black cherry dominated finish. Pop a cork so you can grab the last of its tobacco, cherry, stone, earth, cedar and blackberry nose. Medium bodied, soft and on the gentle, downhill side of life, this is not quite as good as it was in its prime. But what is?